12 gauge shelves have 24" clearance. 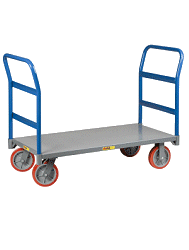 Six wheel design is fully maneuverable with two 8" x 2" rigid center wheels and four 5" swivel corner wheels. Non-marking Polyurethane tread prevents wheel marks on your floor. End panels extend 48" high for extra capacity and are constructed from 1-1/2" x 3/16" slats for extra visibility.